Vase-Painting in Italy (MFA), no. 027. 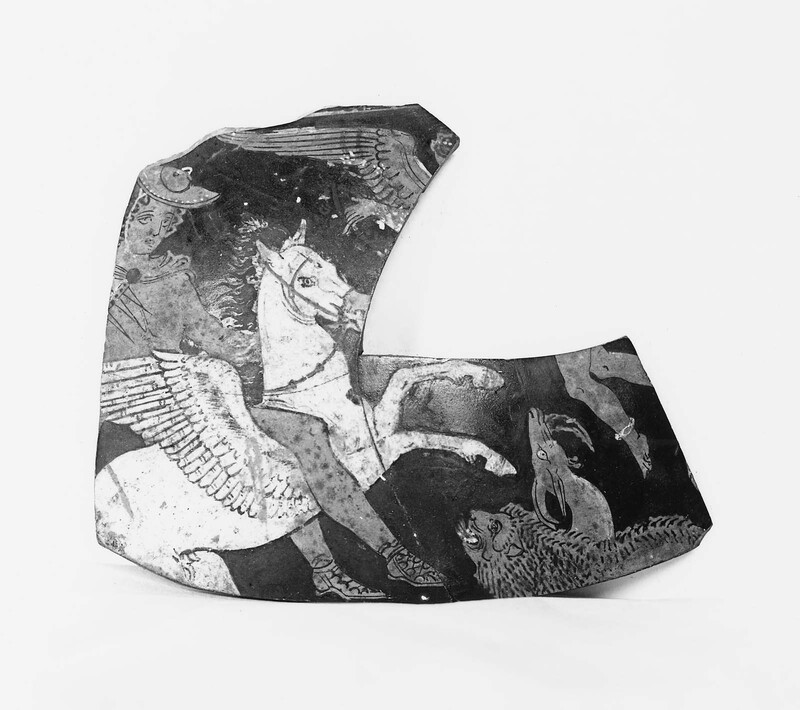 Bellerophon mounted on Pegasus (white) attacks the Chimaera. To him flies a winged figure bearing a wreath. Note: golden brown details; white dots on brim of Bellerophon’s hat, white strap under chin; anklet of flying figure and dots on wing; teeth and breath of Chimaera. Bellerophon, mounted on Pegasus, attacks the Chimaera, who crouches at the lower right. The hero’s weapon is a trident, a symbol of his grandfather Poseidon. His cloak is pinned at the throat with a black brooch. He wears laced shoes and a petasos with white dots on the brim and a white cord. Pegasus is a brilliant white, with a flowing mane and brown harness; the muzzle, ears, and hooves are rendered in beige dilute glaze. The Chimaera’s lion’s head is snarling, with teeth and fiery breath in added white; the goat’s head emerging from its side seems lifeless by comparison. 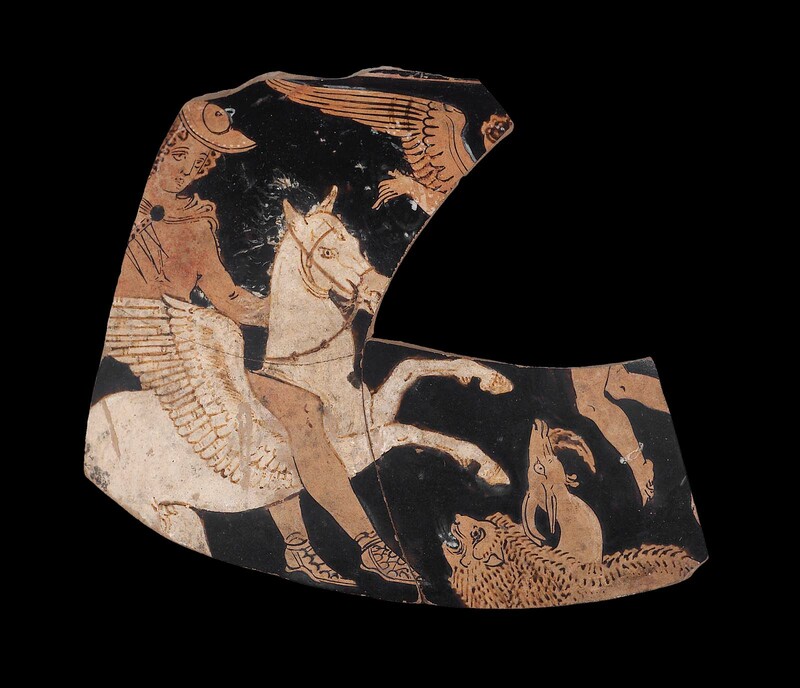 A winged figure flies toward Bellerophon, bearing a wreath; one expects Nike, but the white anklet suggests it is Eros, perhaps alluding to Bellerophon’s subsequent marriage to Philonoe. For Bellerophon and Pegasus, see cat. no. 8, with references. Compare the rearing Pegasus on an oinochoe, cat. no. 71. For the Chimaera, see A. Jacquemin, LIMC, III, 1, pp. 249-259, III, 2, pls. 197-209.